Grady Champion has enjoyed success over the past couple of years, winning the IBC a couple of years ago and releasing one of 2011’s best blues disc (Dreamin’). A lot of Champion’s newer fans may not realize that the singer/harmonica player released a couple of discs for Shanachie Records in the 1999 and 2001 (Payin For My Sins and 2 Days Short of A Week) that most fans thought would put him on the fast track to blues stardom. Both discs were produced by former Robert Cray producer Dennis Walker and featured some top flight musicians such as Duke Robillard, Richard Cousins, Mike Turner, James Itveld, Ben Peeler, and Lee Spath. These tracks show that Champion has always been comfortable in a variety of blues styles, whether it’s the country blues of “Roberta,” or a taste of Memphis soul with “Love is My Middle Name” or “Payin’ For My Sins,” or the blues/rock edge found on “Brother , Brother,” or the buoyant R&B of “I’m Smilin’ Again.” He also manages to work in a Texas shuffle (“Let Me Be”) and even a smooth urban blues (“Nothing I Can Do”). Champion decided to take a sabbatical after his stint with Shanachie, moving back to his native Canton, MS to study music and spend time with his family before resurfacing for real in 2007, with a live disc recorded with Eddie Cotton at the 930 Blues Club in Jackson, Mississippi. Shanachie Days shows that pretty much from the beginning, Grady Champion was a rising star in the Blues constellation. He continues to shine brightly today. My first introduction to Grady Champion was at the IBC in 2009. His band was assigned to my venue, the Rum Boogie, competing with bands from all over the world. The second night we were way ahead of schedule and Grady’s onstage, waiting impatiently for his band to show up, wearing out some shoe leather. He went on to win in 2010 and has been tearing it up ever since. His latest disc, Shanachie Days, is a retrospective of cuts taken from two records he cut for Shanachie back in the days between 1999 and 2001. Grady’s got a great catalog and this disc showcases the talent of a Mississippi bluesman who has worked extremely hard to get to where he is today. Let’s hit play and give it a listen. A smooth R & B groove plays next as Grady tells us about a trip to visit his girlfriend in “Policeman Blues.” “Mr. Policeman…what you’re doing is cruel…why you can’t find something else to do!” Grady’s been stopped, a victim of racial profiling…and he’s done nothing wrong. Blistering guitar carries us into the next cut, “Dreamin”. “I’m dreaming….dreaming of loving you…if I had you in my arms…I know just what I’d do…I’d love you girl…like I’ve loved no one before!” Grady is definitely on the trail of a new conquest and his intentions are clear, that’s for sure! Grady’s harp is at the forefront of the ballad up next, “Roberta.” “If someone sees Roberta…tell her Grady is looking for thee!” Obviously a fixture in Grady’s mind from his past, he’s wishing he could go back one time. So of course we’re back to Grady the lover in “Love is My Middle Name.” “I’m not a man who plays no games…count on me baby…love is my middle name!” Grady will definitely treat this woman right if she chooses to let him in. A brilliant sax solo accentuates the determination he has in the chase; hopefully she’ll give Grady a chance. In “Let Me Be,” we find Grady running in the opposite direction from a woman looking for a ring. “I’m sorry conclusions…just don’t jive with mine…I won’t be forced…real love baby…runs its course!” He’s not feeling it and a ring definitely won’t happen here. “Honeybee” finds Grady appreciative of the woman after him now, “honeybee…honeybee…come on and land on me!” Grady lets his harp do the talking and the honeybee is getting real close! We find Grady remorseful on the title cut of his first disc for Shanachie, “Payin’ For My Sins.” “I realize baby…Grady was wrong again…but blame your sister too…and please forgive me…for all my dirty sins!” I don’t think Grady is getting out of this one that easily, he’s done wrong and will have to pay. “Stop Chasing Me” finds the devil on Grady’s tail and wicked slide guitar from Alan Mirikitani lets him know the devil is getting close as Grady pleads, “Devil, devil…stop chasing me!” In the next cut, “Nothing I Can Do”, Grady’s heart is broken and he’s missing his woman. “My baby’s gone…my baby’s gone…and I didn’t do nothing wrong….I gave her everything….until I was flat broke…my baby’s gone…and I didn’t do nothing wrong!” Relationships end for a variety of reasons and Grady just needs to move on. “Children of the Corn” finds Grady examining violence in our schools. “Why would a child pick up a gun…take it to school and shoot someone….child of the corn….come on!” It’s a perplexing problem to be sure, and one that doesn’t have an easy solution. In “You’ve Got Some Explaining to Do,” Grady is looking for answers from the woman who has done him wrong. “You said you went to take care of your momma….well I called her on the phone…she said she ain’t been sick since last July…and you ain’t been by her home…you’ve got some explain to do!” Time to let this one go Grady and move on. Shanachie Days closes with “Trouble Mind,” “Wine and Women” and “My Rooster is King.” “Troubled Mind” finds Grady contemplating the source of pain and mistrust in his life, “Wine and Women” is Grady’s take on the fact that liquor and women sometimes make for strange bedfellows, and “My Rooster is King” is Grady letting us know that he’s the rooster in the hen yard, and I’ll leave it at that. 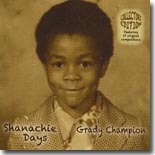 Grady Champion has an outstanding back catalog, and Shanachie Days does an excellent job of showing the listener exactly that. This retrospective is definitely one of the highlights of the year so far, and I appreciate the thought that went into its design, song sequencing and execution. Grady closed out this year’s Blues Music Awards in fine style, and listening to this disc will give you a great indication of what you missed if you weren’t in Memphis. Order the disc and learn more about this rising Mississippi bluesman at www.gradychampion.com. If he’s in the neighborhood, catch his live show for an experience you won’t regret.